By Eric Thomas: WBO cruiserweight champion Maro Huck (34-1, 25 KO’s) has a big opportunity in front of him when he faces WBA heavyweight champion Alexander Povetkin (23-0, 16 KO’s) next month on February 25th, at the Porsche-Arena, Stuttgart, Baden-Württemberg, Germany. A win for the 27-year-old Huck will land him a big money fight against one of the Klitschko brothers, and unlike Povetkin, Huck will gladly take the payday fight against either of the Klitschko brothers. Huck, a former Taekwondo world champion, has dominated the cruiserweight division for past two years, beating excellent fighters like Victor Emilio Ramirez, Ola Afolabi, Adam Richards, Brian Minto, Matt Godfrey, Denis Lebedev and Hugo Hernan Garay. Huck is moving up in weight to get bigger paydays at the heavyweight level where the money is a lot bigger. If Huck can win a heavyweight title, he’ll be huge in Germany and a lot more popular than he already is. However, it’s not going to be easy for him to beat Povetkin, as the Russian has much more experience in boxing. He’s not like Huck who picked it up late and succeeded on brute strength alone. Povetkin had a decorated amateur record with a gold medal in the 2004 Olympics as well as gold medals in the 2002 European championships, 2003 World championships, 2004 European championships. Whatever Povetkin took part in during his amateur career, he was successful. Povetkin isn’t any bigger than Huck, but he’s got a lot more technique than him and can block punches a lot better. Lebedev had problems against Russian Lebedev in December 2010, struggling with his combination punching and power. Huck couldn’t land as much as he’d like to, as he seemed tired and was taking some big shots. Povetkin is bigger than Lebedev if not stronger and he’s going to really put on Huck in this fight. 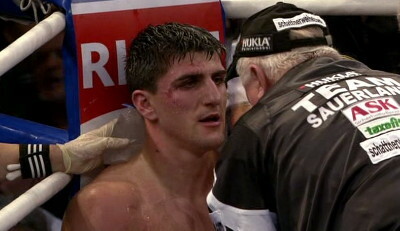 If Huck isn’t up to the kind of pace that Povetkin puts him in, then he’ll lose. The one thing that may mess Povetkin up is his trainer Teddy Atlas, who has tinkered with Povetkin’s fighting style and has him boxing more and not throwing as many punches as he used to do. That’s made Povetkin a less effective fighter than he was in the past, and he’ll be vulnerable against Huck if he can’t throw a lot of punches and put pressure on him.